Devonshire Road Rock Gardens have a long history in Blackpool, first being opened in 1925 to the public of the day. Like many parks, it fell into disrepair over the years of the twentieth century, but in 2006 a £20,000 Heritage Lottery Fund helped to bring it back to life. 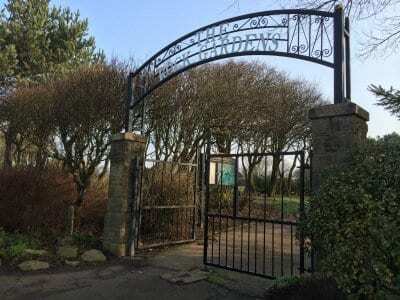 The Friends of Devonshire Road Rock Gardens have helped to raise the profile of the park, and funding has been secured in the last ten years from a variety of sources to make some very welcome improvements, like the new paths which were laid in 2007. 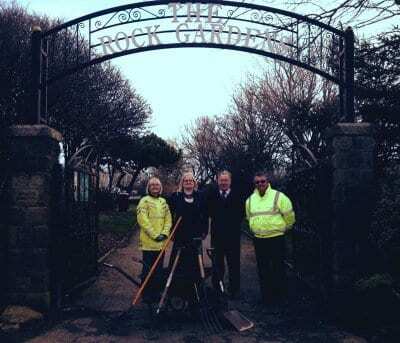 Friends of the Devonshire Road Rock Gardens won the Open Spaces Award at the Blackpool Civic Trust Awards Dinner in 2015 for the work they have done in repairing and renovating the Vista building at the gardens. This award recognises a small but dedicated Friends Group who have worked to restore one of the most romantic landscapes in Blackpool. Devonshire Road Rock Gardens was created in the 1930’s to provide a public park for new housing in the area and to take advantage of rolling views across to the Trough of Bowland. The real gem in the park though is The Vista, a small Italian style rustic pavilion with a terrace overlooking the hills to the east, below which pools and waterfalls follow the fall of the hill. This was used for thousands of wedding pictures from the 1930’s until the 1980’s. The Vista had been subjected to vandalism for many years and had become a roofless ruin, partly overgrown until the Friends started to raise funds to restore it in 2012. By 2013 enough had been raised through events, generous contributions from Ward Funding and other sources, for work to begin. A year later and the roofs are back on, vandal proof doors and windows have been installed, the terrace repaired and the Friends now have a place out of the rain for storage and brewing up whilst looking at the incredible view! The gardens are built on the site of Beryl Hill, which is believed to be the site of a cairn and beacon used to warn of Napoleonic invasion. The view from the top of the gardens is quite stunning on a clear day, stretching over to the Bowland Fells and Pendle Hill. Devonshire Road Rock Gardens stands at the side of Norbreck Water Tower, passed every day by thousands of motorists who travel along (oddly enough) Devonshire Road. With a few minutes to spare early on a bright spring morning in March, for once I stopped my car and went for a look at the gardens. What a lovely spot! 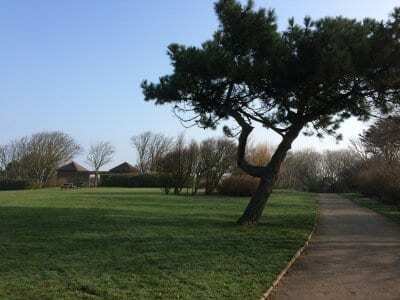 Right in the centre of an urban area is an oasis of nature and countryside, and beautifully well maintained it is too -a credit to both the Friends of Devonshire Road Rock Gardens and Blackpool Council. I used to live inland, in easy walking distance of a park, open fields, woods, and a nature reserve – all of which I often visited, like many people with dogs to walk. But since coming to live at the coast I’ve spent my leisure time being very sea orientated – wide skies and miles of open sandy beach is very different. It was a lovely treat to spend a short time in a proper park, listen to the birds singing their joyous spring song, see the bulbs flowering and the buds emerging on the trees, and watch the wood pigeons pottering about looking for old twigs for new nests. If you need a bit of a breather, fancy a bit of peace and quiet, park your car and go for a walk in the Rock Gardens. The money, donated by Greenlands’ ward councillors Christine Wright and Chris Ryan, is set to be used for a specialist gardener to look after the gardens throughout 2015. 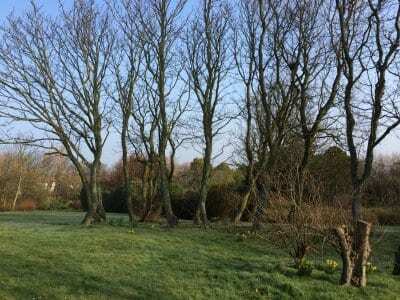 The gardener will carry out maintenance on the grounds, as well as engaging with the local community and working closely with the Friends group to develop the area even further. On top of the gardening role, £3,358.48 has also been donated to the councillors to improve the newly revamped pavilion, namely to provide electricity to the building so that it can be used for more events in the future. An extra £1,531.34 to install and monitor CCTV equipment to prevent vandalism to the restored vista building has also been secured. 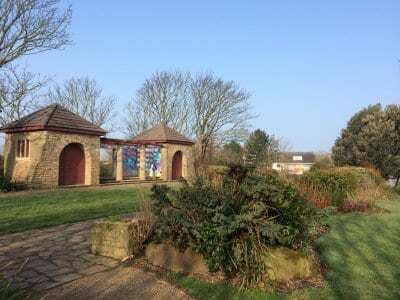 Local ward councillor Christine Wright, said: “The Rock Gardens is a really important part of the local community and I know that residents really appreciate such a calm, relaxing green space right on their doorstep. Fellow ward councillor, Chris Ryan, added: “This funding will make sure that the rock gardens, which have been recently restored by the Council, continue to be looked after so that it can be enjoyed by the public for a long time.